Earlier in the week I led you through the process of translating Petrarch’s Canzoniere 61. I thought I’d share with you the final version that is going to press in Awakening Dreams. There have been a few words changed up to improve consonance and punctuation has clarified meaning. As well, line 2 was altered as it didn’t end on the correct beat (iambic rhythm) in the draft. I found this place, and saw my sweet torment. Her lovely eyes completely tied me here. And weave her glorious beauty in my verse. The thoughts of her that are my blissful curse. Not only did this moment capture Petrarch, but it captivated artists through the centuries who imaged the moment that Petrarch describes in this sonnet, and painted it as they imagined it. The painting on the left is the actual moment of meeting in St. Clara’s in Avignon. I have been in what is left of this convent chapel, as you can see from the photo below. If it really looked like this artist has captured it, it is really very sad to see the ruins that it is now. The picture on the right shows a lot of the symbolism represented in the poem. 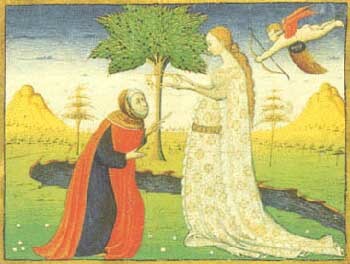 Laure is represented by the laurel tree in the background, cupid (aka Love) has fired his arrow at Petrarch and it has struck him in the heart. Laure is presenting him with the laurel wreath that represents his literary success. (He was crowned Rome’s Poet Laureate in 1341). 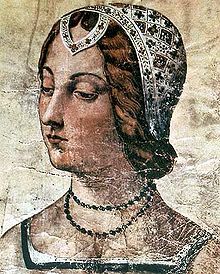 Petrarch himself frequently played with Laure/laurel the woman/fame metaphor. What is interesting in this painting is that Petrarch is shown as an old man, while Laure is shown as a young woman. In fact there are only 6 years between them. (He was born in 1304, she in 1310). Perhaps it represents them at their deaths? She was 38, and he was 70. 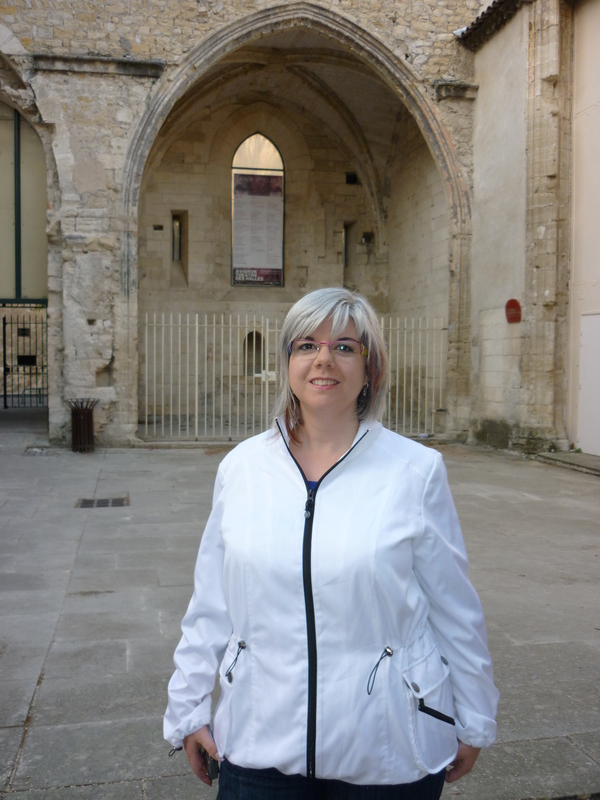 Here I am in the ruins of St. Claire convent, standing pretty close to where the artist set the scene on the left, by the looks of things. I just found the painting this morning, and this similarity kind of gives me chills. There is no roof. It is an open space garden and performance area now. 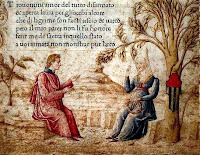 Francesco Petrarca loved old texts. He travelled throughout Europe gathering the literature of ancient Greece and Rome. He’d hire copyists, or he’d copy them out himself. At his death, he had the largest library in Christendom. There is a famous historical biography of Petrarca written by Abbé de Sade in the 18th century. It is quoted liberally in the exhibits at the Musée Petrarque at Fontaine de Vaucluse, so I asked the curator whether they had an English translation. They did not and she didn’t know whether there ever had been. 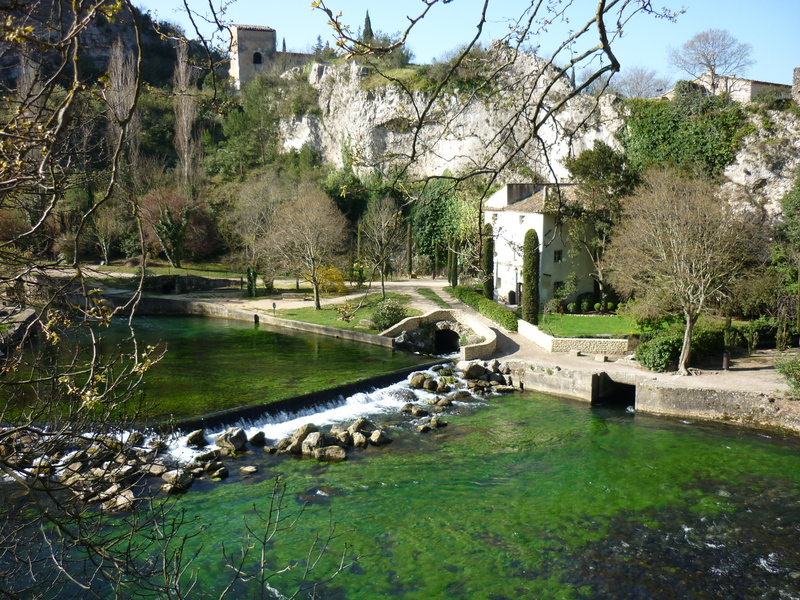 However, by the time we got back to our apartment in Avignon, there was an email from her. She’d double checked with the museum’s librarian. There had been a translation made in 1776 in England by Susannah Dobson. I laughed at that. What were the chances I’d ever see a two hundred year old book? Now that same two volume set is sitting in my kitchen. Two beautiful books. Two leather bound books that came off the press in 1776. That’s 235 years ago. Thats 133 years older than the city I live in. I feel so remarkably awed to have these books in my possession. Petrarch collected ancient books, and I have collected ancient books about him. I guess ideally I’d speak fluent Italian and Latin, and I’d be able to read all Petrarch’s own words whichever language he’d used, but unfortunately I can’t, so I have to rely on translations. Since I can’t find any copies of Abbé de Sade’s Memoires sur la Vie de François Pétrarque listed on the internet, Susannah Dobson’s translation will do for now. Sir John Mordaunt was a rather famous military man in his time, and now his books are at my house. Wild. He lived in Walton Hall in Warwickshire (as you can see on his book plate). These books used to sit on the library shelves in Walton Hall. The house was rebuilt in the 19th century. Presumeably these books were in the Mordaunt library until the home was sold to become a girls’ school in the last century. Imagine. My books used to live in this house. Crazy, eh?